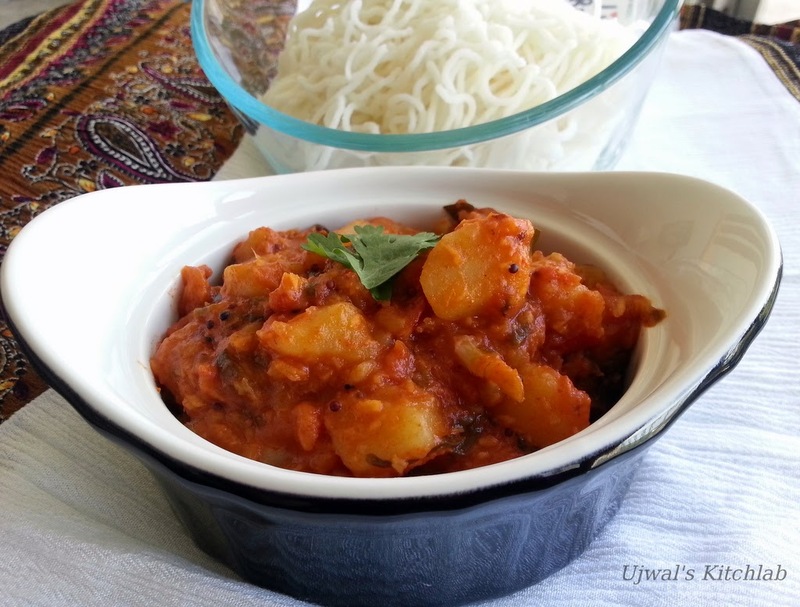 This is a spicy Konkani curry that features in our menu on auspicious days when we don't eat Onion and garlic. It is very easy to prepare with minimum ingredients and yet full of flavour. It has mild sweetness from freshly grated coconut and heat from red chilli powder. I have already blogged about this curry here. Over time I have modified this recipe and this one is our current favourite with extra tang from tomatoes and a hint of coriander. 1) Pressure cook Potatoes for 3 whistles. Let it cool. Peel and chop into bite sized pieces. 2) Heat Oil in a pan. Add in mustard seeds and let them crackle. Add Urad dal and saute until it turns golden brown. Add curry leaf. 3)Throw in the chopped tomatoes and let it cook until mushy. Add the hing powder, coriander powder and red chilli powder. Let it cook for two to three mins. Add in the potatoes. Add salt to taste and mix well until the potatoes are nicely covered with the masala. 4) Turn the flame to medium and add 1/2 cup water. Cover and let it cook. Keep mixing in between to make sure that the curry does not stick to the bottom. When the water evaporates add the grated coconut and saute the curry well for 5 mins. Add in the coriander leaves and give it a quick stir.